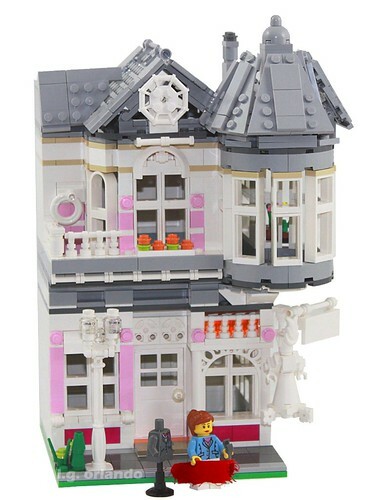 Brick Town Talk: Pretty, Pretty Dresses - LEGO Town, Architecture, Building Tips, Inspiration Ideas, and more! Historic Main Street - (BTT) For multiple generations, Lady Agatha and her descendants have been providing the locals with the very best in fashion from their American Queen Anne home. Despite the pastel color scheme, the ornate details and pink accents give this building some pop and make it as distinctive as their dresses.